Ornate Tabletop Moondial: Small and portable, able to fit on a standard table or shelf. Ornate Moondial: “Normal” sized, similar to existing moondial examples, able to fit easily in most rooms. Ornate Village Moondial: Scaled up in size, this impressively large orrery will fit comfortably on a village-sized lot and freely in POTs. Ornate Keep Moondial: The largest orrery in scale, be the envy of your astronomer neighbors with this moondial that can fit on keep (and castle) sized lots, and can also be placed freely in POTs. Have the moondial that can be seen from the heavens themselves! Obsidian Chandelier: Add ambience to your Obsidian-inspired home with this hanging chandelier utilizing the unmistakable glowing shard. This item will become available from the Add-On store in Release 42. Frosted Glass Chandelier: Make a strong impression on your guests by styling your home with the ceiling light version of our Frosted Glass Oil Lamps. Introduced as a craftable recipe in Release 42. Geometric Stained Glass Chandelier: Brighten your thresholds with the stylized ceiling version of our Geometric Stained Glass Oil Lamps. Available in the Add-On store in Release 42. Aerie Cove: Renamed (formerly Krabnevir). Converted to Forest 01b biome. Ownership changed. Changed location. Catscratch Hovel: Renamed (formerly Blood Omen Caverns). Converted to Forest 01c biome. Ownership changed. Changed nested interconnection to within Brittany Estates. Removed PVP flag. Dara Brae: Changed location. Interconnections added (Kingsport, Littlecreek, Forewind, The Brave Coast, Estercove, and Port Mirren). 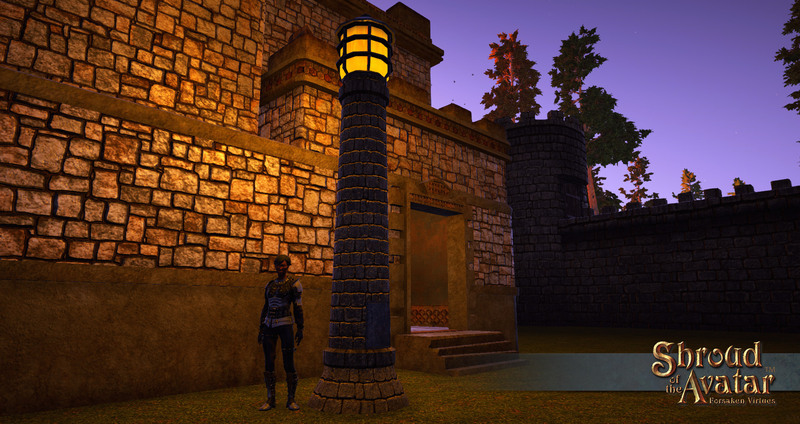 Dawn’s Keep: Interconnection added (Brittany Alleys). Forptycle: Renamed (formerly Heorth). Converted to Forest 02 biome. Ownership changed. Changed location. Flagged for PVP. Glasgow Oasis: Renamed (formerly Numinous Gleann). Converted to Desert 01b biome. Luna City; Renamed (formerly Raven’s Head). Ownership changed. Changed location. Reverie: Upgraded to Crossroad Village. The Caverns of Kahli: Interconnection added (Braemar). Virtue Oasis: Converted to Desert 01b biome. Whyte Roc: Upgraded to Metropolis. Spiked Club (1-handed Mace): Drops from mid-tier fighters. Long Club (2-handed Mace): Drops from mid-tier fighters. As seen throughout New Britannia brightening the hearths of many taverns, a simple iron chandelier with candles ensconced. Crossbows: Crossbows can now be enchanted and gem-socketed. Wizard’s Hat: Wizard’s Hats can now be masterworked. Obsidian Longsword: The world-item recipe for the Obsidian Longsword will now appropriately deliver the Obsidian Longsword Recipe, and not just the Longsword Recipe. Backpack: Crafted backpacks will now have working durability, and appropriately deliver leather scrap on salvage.